There are 2 reviews of Ferrari Essence Musk. The name fits it perfectly.an distinctly musky masculine and bursts with energy and vitality.Ferrari fragrances extremely nice for its price.anothers popular aromatic scent with a dint of sportiness.the top notes is most enjoyable but the dry down exudes a rather generic muskiness that catches the last flickers of nutmeg and cedar.Simple,Aromatic,Casual, Ethereal,Refreshing,Clean,Citrusy,Modern,Delightful and Super Easy to wear. The dominant marine and citrus accords in the top notes bring the boundless energy of the ocean to you .the heart notes of juicy watermelon and aromatic mint keep your spirits high for a long time while the dry down filled with musk and woody notes makes it a man's choice and a woman attractor.not my cup of tea. a nice everyday type smell for spring and summer months.the price is very good for the big sized bottle. Longevity?About 5 hours on my skin. Ok, Ferrari Essence Musk is a mainstream fruity ozonic concoction with a first salty-fruity-minty stage close to dozens aquatics out there but the sharper dry down is mastered by this spicy and manly amber presence (supported by cool musky cedarwood) really piquant, bold and simil-organic. Extremely virile ozonic aroma absolutely not over chemical in perception. Watermelon, citrus and lavender are heady together with musk and synthetic spicy ambergris. Good performances in general. I get alikeness with many juices out there as for instance L'Eau d'Issey Pour Homme Oceanic Expedition or Bond N. 9 I love NY for Fathers (but in general with dozens of sporty Lacoste, Tacchini, Bvlgari, Armani, Adidas or stuffs like those) but Essence Musk is really one of the best in its genre (finally warmer, musky-spicy and refined). I detect a really "smart/fancy/greasy" aura around the wearer. In conclusion, a more than decent musky ozonic creation, cute bottle, not my cup of tea unfortunately. There are no member images of Ferrari Essence Musk yet. Why not be the first? 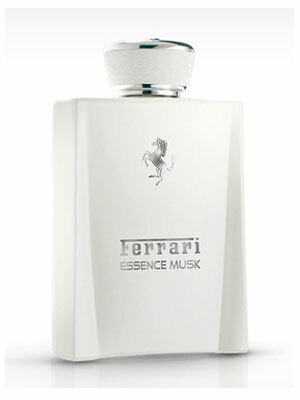 Anyone tried Ferrari Essence Musk eau de parfum?